We’ve all been there; sitting out on our porch enjoying a day off and soaking up as much of the vitamin D that we can get. Maybe you’re not so much a “porch person,” but you look forward to slow days spent at home in your most comfy clothes, cleaning or relaxing with the windows open, letting fresh air permeate your home, clearing away that stale smell and old stagnant air. The fresh air is not only needed to keep yourself and family healthy, but it is invigorating and a simple means for happiness. Regardless of how you like to take your fresh air, you’ve probably experienced the annoyance of your peaceful state being interrupted by six and other multi-legged pests. It doesn’t matter how extensive the outdoor space, they always seem to make it into your porch area, your home, and other spaces, buzzing around your face, landing on top of your head, and worse yet, biting your extremities. It isn’t just these six-legged bullies that can put a damper on your fresh air experience. Large plant seed heads and other organic—and sometimes non-organic—items can also find their way into our homes to make a mess and disgust us. We at Metro Screenworks and those at Genius® have all been there and weren’t going to put up with being bothered by insects and other annoyances. We weren’t going to continually suffer the annoyance of shooing out or killing flies lost in our homes, and we weren’t going to just stay cooped up in our homes with stale smelling, stagnant air. All of these reasons are valid. However, in most cases most customer’s reluctance is due more to them not knowing about retractable screens. Retractable insect screens and, specifically Genius® retractable screens, are our answer to wanting to have protection from insects and other pests. There are a lot of things that you should probably commit to, but a permanent screen door, window screens, and porch screens don’t have to be those things. With Genius retractable screens, you get to choose when you have insect screen and when you don’t. Metro Screenworks only partners with screen product manufacturers that share the same values that we do: quality, custom options, and expanding the possibilities of what screens can be. Genius® does just that. According to Genius’ website, they are the “dominant supplier of retractable screen technology to many of the world’s best-known window and door manufacturers” and have been since 1980. Though their beginnings are based in Europe, each retractable screen is assembled in the U.S. Their commitment to “protection against insects, supporting fresh air, and enhancing viewing pleasure of their customers” is easily seen in the construction and functionality of their retractable screens and the options they provide their customers worldwide. 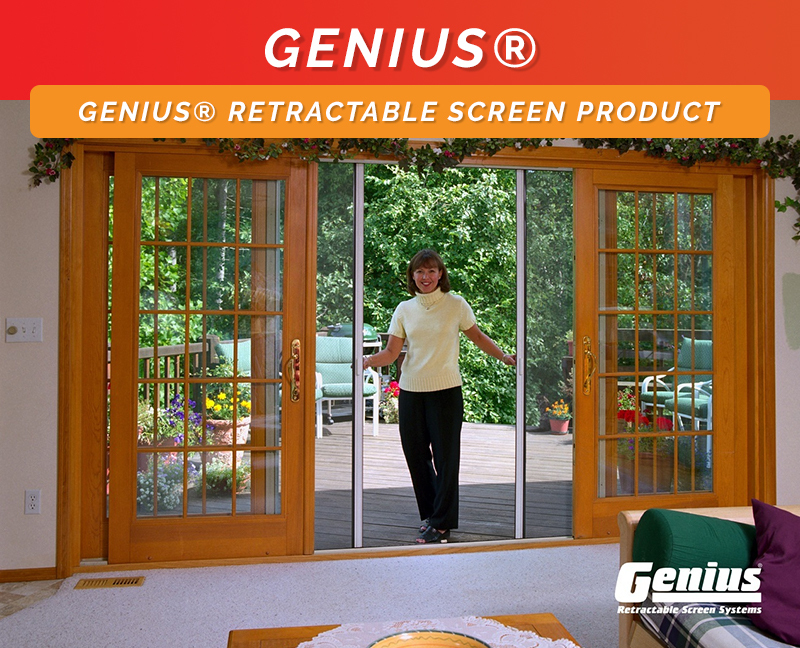 Installing your Genius® retractable screen is easy and just takes a few steps. Genius provides the parts you need to get the job done, but you will need access to a saw, screwdrivers, and a few other tools. One of the reasons why we love Genius retractable window screens is for their versatility. 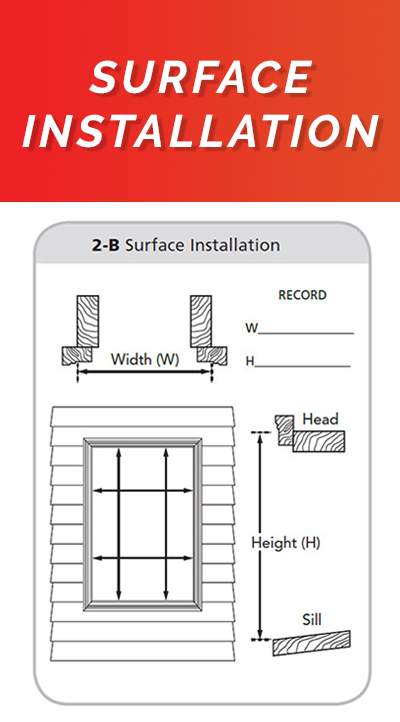 Each retractable screen door can be installed inside, on the jamb, or installed on the outside surface mount. 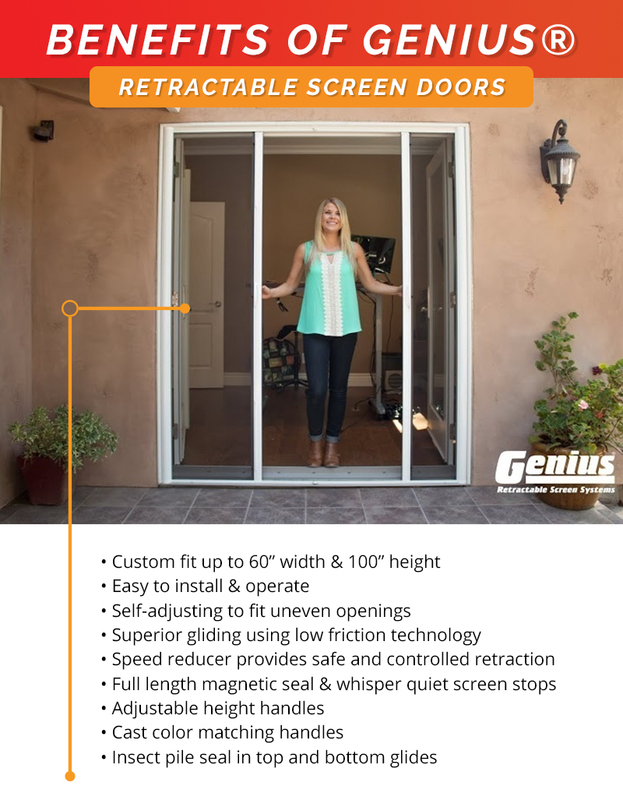 To learn more about installing your Genius retractable screen door, watch the above video, keep reading below, or check out our instructions for Genius Milano 100 Single screen door. If you have any questions about installing your Genius® retractable screen door, contact us! We would love to help you to not only confidently install your door, but have the proper tools and parts to get the job done right! When you shop online, you have access to many of the screen tools and parts you need. However, you may have to make a trip to your local home improvement store for tools such as a saw and screwdrivers. When you are working on a home improvement project, you want something that you can rely on, especially if you are going to invest your money in a product and dedicate time and effort to it’s installation. We at Metro Screenworks only provides the highest quality products that do exactly what they say they do. We would love for you to have enough faith in us and the products that we merchandize, but we also recognize the value of a customer review. Read reviews from customers like you, who installed their Genius® retractable screens below or on our website! This is a good product and is serving our needs well. Received the box. Well packaged. Opened it and started. First question was right or left? Do you determine from inside out or opposite. Figured that out (would have been good to have that in the instructions) the next step was to remove and replace the end caps. Harder than it looked in the instructions but got it done. Most difficult was to attach the cassette to the clips. Again takes some courage and strength. When you have done it a few times easy peasy. All of that being said I am going to order one for another door. I like it. Like the way it functions and like the quality. French doors are a classic look that fit a variety of building and home styles. However, if you have them, you may have assumed that screen doors were not going to be something that you could enjoy, which—in our opinion—completely defeats the purpose of having French doors! French doors are made to add style and functionality through looking beautiful and providing a bigger opening for not only enjoying the view, but also for natural light and fresh air. Genius® once again, fills a need to have protection from bug pests and other substances or objects that are floating through the air while also having whatever door you want. 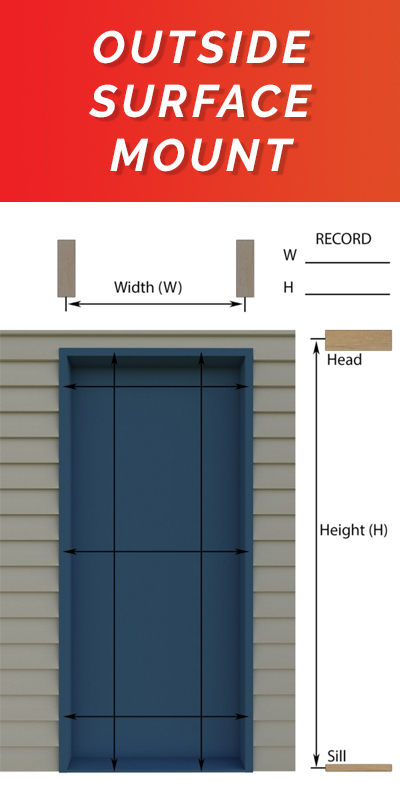 Like all Genius® products, installing your Genius siding screen door for French doors is easy. However, it does requires some measuring, cutting some pieces to length, and having basic tools such as a saw and screwdriver. Metro Screenworks is the online screen store that provides all you need for installing and repairing your screens. You will need to head to your local home improvement store or ask your handy neighbor for the more basic tools that you will need such as a saw and screwdriver. 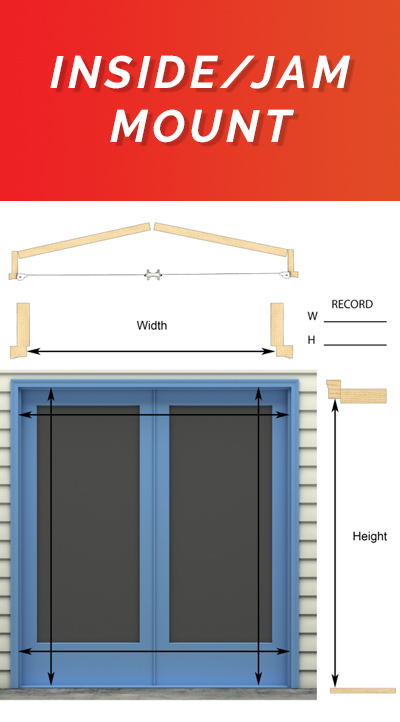 Not sure if a Genius® sliding screen door for French doors is for you? We at Metro Screenworks completely understand! Choosing to invest in a quality screen door is a big deal, for not only does it cost money, but it also costs you time installing it. Read client reviews below or visit our website to learn more about this revolutionary product! Have the protection of a screen whenever you want. When not in use, your screens no longer obscure your view. Genius retractable screens for windows are customizable to fit the style of your home or building with multiple frame color options and installations styles. With all of Genius products that Metro Screenworks carries, you can always rest assured that you will get a quality product that you can easily customize to meet your needs. As we alluded to above, retractable window screens offer those things that traditional window screens do not and are actually far superior to traditional window screens in many ways. Since we already discussed this above, we will keep our explanation brief. If you are blessed to live in an area with a great view, why have it obscured by a screen? Yes, a traditional fiberglass screen doesn’t obscure your view “that much,” but if you install any other heavier duty screen, you can assume that your view isn’t going to be quite the same as if you were looking at it with your naked eye. What’s more, if you don’t have any other way of viewing your scenery other than out that one window, you will never get the full effect of your view. With Genius® retractable screens for your windows, you choose when you are looking through your screen and when you are seeing your view crystal clear. Yes, your window screens really do affect your energy bills. Window screens can not only block harmful UV rays that tend to create more heat for the air conditioner to battle, but they also keep some amount of heat in during the colder months. With retractable screens, you have more control over when you receive the protection of your screens, as well as how much protection. If you want a heavier screen that provides more UV protection during the summer, you can install a thicker, heavier screen, but sometimes it’s nice to have the aid of the sun’s heat during colder seasons. Retractable screens allow you to not only get the most protection that you need, but to also have that protection when you want it. In many areas of the country during multiple times of the year, we have to deal with harsh elements such as strong winds that can blow dust, debris, and other weather elements into our screens, ripping, stretching, or damaging our screens in some other way. Traditional screens that stay in place often get the brunt of mother nature’s wrath and are the bane of many homeowners or business owners who must repeatedly fix or replace their screens. Retractable screens, however, can be hidden away during those times when the storms are raging outside, saving you time and money not spent installing new screens. The value of our home isn’t just what it looks like on the inside or how many renovations it’s undergone to have the latest comforts and gadgets. Part of the value of your home does come from its curb appeal. Unfortunately, depending on the style of your home and the screens you have installed, your window screens can obscure some of the best elements of your home and can negatively affect its appearance. When you install the best retractable screens by Genius®, you can roll up your screens when you want to, allowing the beauty of your home and all those upgrades that you made to it to shine through. There is a time and a place for everything; however, we at Metro Screenworks think that, even though Genius retractable screens for windows haven’t been the traditional choice, that you and your family or stakeholders will love all the benefits that they will provide. 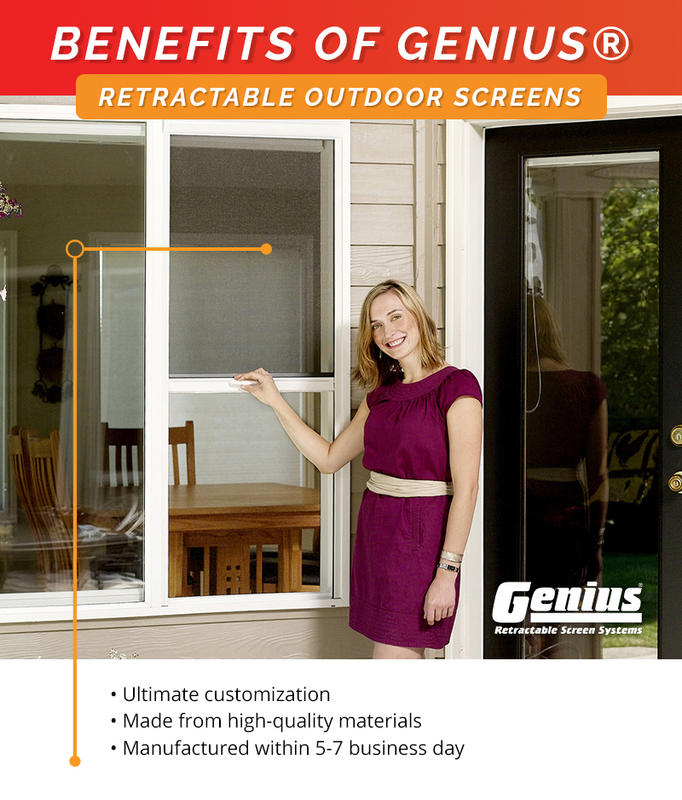 As we mentioned above, installing your Genius® retractable screens for windows is easy. All the parts that you need are provided and the tools that you will use to install your retractable window screens can be found in most handyman tool shops, tool boxes, or at your local home improvement store. 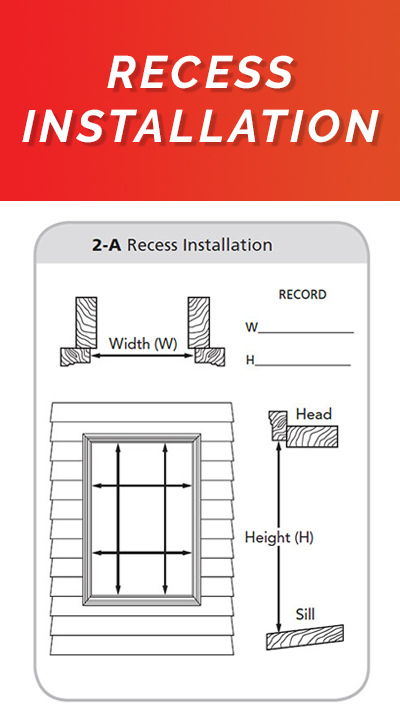 There are two ways that you can install your Genius retractable screens for windows: recess installation and surface installation. 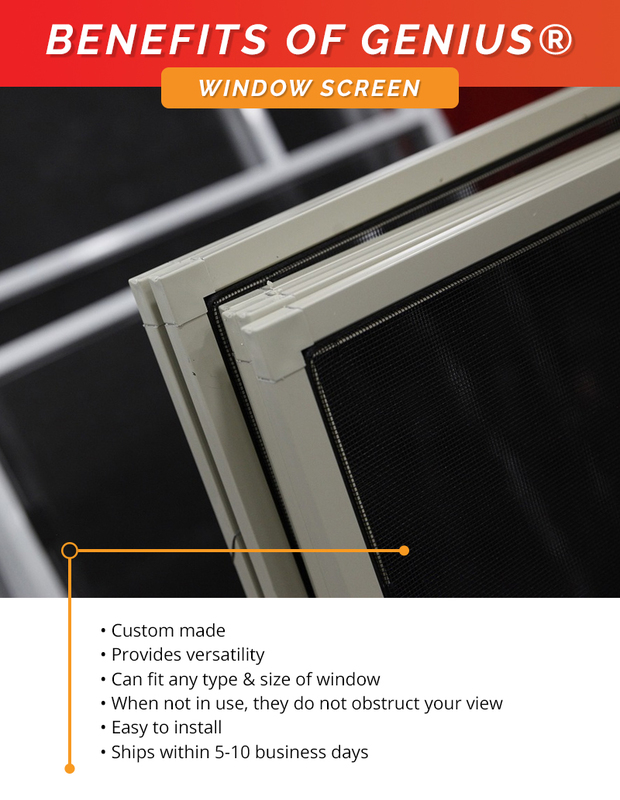 If you have any questions about how to install your window screens, contact us! We have our screen professionals available through email, chat, and the phone. With an unconventional product such as a retractable window screen, you may be a little more skeptical to invest money and time installing them. To put your mind at ease, we at Metro Screenworks have customer reviews of our Genius® retractable screens below. However, we only offer the best window screens and screen products because we understand how important it is to get what you pay for and have screens that truly do what they say they do. To read more reviews, visit our website. I have not done the outside installation yet but the product looks excellent and the measurements were precise. overall, the product is operating as promised. the profile is nice and the screen operates smoothly. Enjoying time spent on the porch soaking up some well-deserved vitamin D or opening up the garage to spend some down time working on your collector’s car without the nuisance of obnoxious flies, mosquitos, and other insect pests is something that we all want, but most settle for less. Genius makes all of this possible with their retractable outdoor screens. Our outdoor screens can allow you to make your dream home a reality and have the lifestyle that you deserve. To learn more about the retractable outdoor screens Metro Screenworks offers, visit our website! Metro Screenworks is an online screen store that offers screen products, tools, and parts that are far superior to others that you may find at your local home improvement store. To read more about our products, how to effectively use them to create your dream home, or build that home that fits the specifications of your client, visit our blog! We post regularly to help you get the most out of your screens and explore all the possibilities that customized screen products can provide!